Denise Kester is a renowned teacher and international artist. She has been teaching workshops and classes for 20 years in the creative arts including monoprinting, collage, mixed media, and book arts. She has presented “Awaken Amplify and Sustain your Inner Artist” with Jean Houston’s Seminars and Women of Wisdom conferences of Seattle Washington. She has been an Artist in Residence at the Horace Mann School of New York. She has been exhibiting and selling her original works since 1985. She is a recent featured artist on Oregon Public Broadcasting’s Art Beat. Denise Kester is represented by Hanson Howard Gallery of Ashland, Oregon. Her favorite place to teach is in her studio located in a garden setting with the sound of Ashland Creek in her back yard. Animals, birds, and the natural world fill her work with myth and stories. Her work is life affirming. 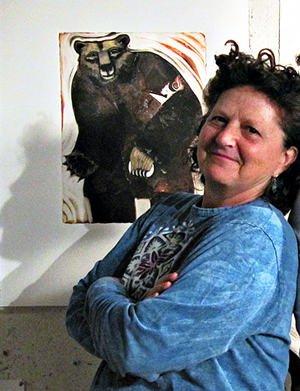 Denise has a working studio at the Ashland Art Center that is open to the public daily. You can view her new work and works in process. I am an artist working to tell stories from my heart, stories that I dream and that dream me. I am painting, drawing, and creating images that have a life of their own. I am aware of the state of the world. It troubles and saddens me. Sure there’s lots of doom and gloom, plenty to go around. Sometimes when I am depressed or worried I will create the most lighthearted images. These are the images that come and I do my best to let them tell their story. Some of the stories are in the title and that is enough. Some of the pieces have more to say. I think sometimes the images are trying to cheer me up. Life can be hard but life is also full of beauty and stories that are silly and absurd and just as important and maybe more important than the constant bombardment of awfulness. what is precious to me, to life, to peace. dedicated to the beauty of the earth – No matter what.